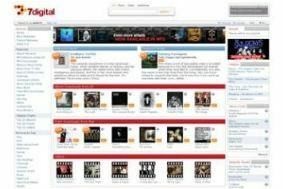 7Digital download service offers 320kbps MP3s from the 'big four' labels | What Hi-Fi? Sony BMG, Universal Music, Warner Music and EMI Records all offer music through 7Digital, and all four million of the tracks on there are entirely DRM-free, meaning you can use them how you please. Also, should you have downloaded WMA files from 7Digital in the past you can now have them upgraded to 320kbps MP3 files for no extra cost. And there's more: to celebrate this news 7Digital is offering all users two entirely free albums – pre-chosen by 7Digital – and is selling a selection of other content at just £2 an album. To see the site in action yourself and find out about the special deals currently on offer – you might as well get yourself some free tune – click here.